The original photo that captured so much attention. Editor’s Note: Darleen Prem shares photos of Woodstock events with our magazine on a regular basis. When we saw this compelling photo of a young girl, obviously emotional during the city’s Law Enforcement Memorial Ceremony honoring fallen officers, we dug a little deeper to find out what moved her that day. Apparently, the photo not only got our attention, but that of Cherokee County Sheriff Frank Reynolds. Curtis and Cathy Kramer, their sons Will and Austin, and niece Katelyn Gann were enjoying dinner in downtown Woodstock when they decided to attend the Law Enforcement Memorial Ceremony at The Park at City Center. It was a moving ceremony that brought emotions to the surface, with bagpipes and trumpet sounding a solemn tribute to fallen officers. 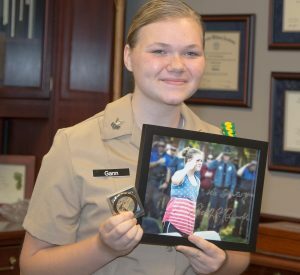 It was an automatic response for Katelyn, a rising junior at Woodstock High School and member of the ROTC. Curtis wasn’t the only one to notice Katelyn’s patriotic act. As the family was leaving the ceremony, Ken Ball, chief deputy of the Cherokee County Sheriff’s Department, approached Katelyn and asked if he could give her a hug. Ball told her that he had been doing well keeping his emotions in check until he saw Katelyn’s emotional salute, and thanked the family for their support. 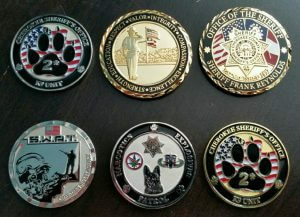 Another officer stopped them on the way out and gave Katelyn a SWAT team challenge coin. Katelyn said her Aunt Cathy explained this was significant because officers carry coins for a number of reasons, including sentimental attachments or for good luck. That was just the beginning. When Woodstock photographer Darleen Prem posted the photo on Facebook, asking if anyone knew the young lady saluting, Cathy Kramer responded with Katelyn’s name. “That next morning, my uncle knocked on my door and said, you’re famous! Your picture is all over Facebook,” Katelyn said. A few days later, a sheriff’s deputy visited Woodstock High School with a copy of the photo to help him locate her. Katelyn’s ROTC instructor, Gunnery Sgt. Keith Myrick, happened to be in the school office when the deputy arrived and was able to take him to Katelyn’s classroom. 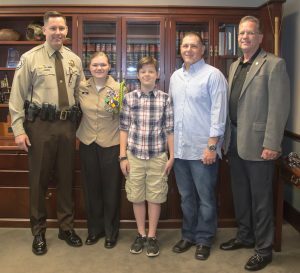 Sheriff Reynolds with Katelyn, her cousin Will and uncle Curtis, and Chief Deputy Ken Ball. The deputy was there to invite Katelyn and her family to a special ceremony and presentation by Cherokee County Sheriff Frank Reynolds. During the presentation, Reynolds gave her a framed photo of her saluting in the park, which he had signed. While Katelyn and the sheriff were talking, Curtis mentioned to the sheriff’s assistant that Katelyn loves animals and thought about becoming a K-9 officer. After a few phone calls, Katelyn was surprised with a visit from two K-9 police officers. All of this happened because she stood up and saluted, doing what her heart told her to do, Curtis said. 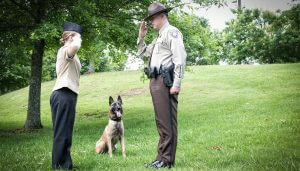 Before this experience Katelyn wasn’t sure if she wanted to pursue a law career or join the military and then become a K-9 officer. Now, she said, there’s no question in her mind. And she is well on her way, having recently ranked No. 1 at Woodstock High in air rifle. Leadership camp is on the agenda this summer, another activity to bring her closer to her goal of becoming an officer. Katelyn credits her aunt and uncle, who’ve had guardianship of her for two years, for encouraging her to follow her heart and join ROTC when she started high school. “They have had a big influence on me. I probably wouldn’t have done any of this if I weren’t in ROTC,” she said. Another of Katelyn’s favorite memories from her meeting with Sheriff Reynolds. The patriotic teen has a few important messages to share. 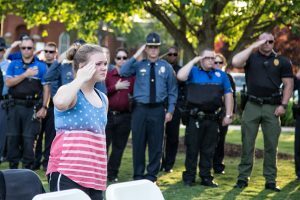 Let’s join Katelyn and her family at the next Law Enforcement Memorial Ceremony, which is tentatively planned for 7 p.m. May 14, 2018, at The Park at City Center in downtown Woodstock. Visit www.woodstockga.gov for updates. Wonderful story!! Another example of God’s love, if we’ll only follow His lead! Thank you, Katelyn, and Sheriff Reynolds, for following God’s lead!! I Love God, and I love The USA!!! ????? ?